Home › White Papers › Bringing archetypes to life to drive sales in eClinical marketing. Archetypes have four main roles within the context of an organization’s life science sales and marketing activities. Several of these roles (alignment and communication) apply inside an organization and several (communication, resonance and differentiation) apply externally. In this issue, I’ll examine each role in turn and show how these roles support sales and marketing success in life science and biotech organizations. The four roles of archetypes. These four are shown in figure 1. I’ll examine each of these in this issue. Figure 1. There are four functions that archetypes play within an organization, 1) alignment among internal personnel or departments, 2) expression (both internal and external), 3) resonance (how receptive your internal and external audiences are to your messages) and 4) differentiation (the audience’s perceived uniqueness of your organization). The correct use of archetypes helps internal teams align. When I speak of internal teams, I’m including all employees, not just marketing or sales personnel. Alignment depends upon all employees clearly understanding and internalizing your values (what you stand for), your processes (how you approach business), your culture (how you relate to each other) and your personality and tone of voice (how you communicate). An archetype is an efficient system for identifying, communicating and managing all of these. And once your employees understand your archetype, they’ll have clear guidelines for self-directing their own behavior. For example, think of the Citizen archetype. If a company communicated, thought and behaved like an authentic Citizen, what values would they live by? Would they be group-oriented or oriented only towards the individual? Would their processes be built on hard work by teams or flashes of insight by individuals? Would the internal culture be more egalitarian or strictly hierarchical? Would the tone of voice be reasoned or strident? Each of us answered these questions in the same way. That’s right, you knew instinctively that the right answer was the first option in every case, didn’t you? Well, so did every other person who has a clear understanding of the Citizen archetype. That’s because each of us recognized the pattern of the Citizen archetype, and we knew what values, process, culture, personality and tone of voice would fit with this archetype. This example shows the power of archetypes to communicate expectations very clearly, whether these expectations relate to values, processes, culture or tone of voice. If your organization selects one particular archetype to guide its values, processes, culture, personality, and tone of voice, and if every employee understands that your organization is going to live by the patterns of behavior embodied in this archetype, then your employees have a clear set of guidelines by which to behave. In other words, archetypes help internal teams align. Archetypes help define the personality and the tone of voice of your organization’s communications, marketing and sales activities. This communication can be to internal teams, external targets, or both. While you might think that communication with internal audiences would be significantly different from that with external audiences, there are a surprising number of similarities as far as archetypes are concerned. For internal communication, consistency is key. It is crucial that your organizations’ leadership understand, internalize and exemplify your archetype, to guide their communications in style and substance. In the best of all worlds, an organization’s internal culture is already a strong match with the chosen archetype. In these cases, it is possible that a leadership team’s natural tone of voice and communication style already align with the chosen archetype. These cases are rare and in all other cases, training is necessary to ensure that the tone of voice is consistent from one speaker to another, and across time. Once the leadership team has been trained on the archetype and it’s implications for behavior, tone of voice and “personality”, consistency in the internal tone of voice become much more prevalent. Archetypes help with internal communications. For external communications, consistency is key. It is crucial that your public facing employees understand and internalize your archetype, to guide their communication in style and substance. In the best of all worlds, an organization’s internal culture is already a strong match with the chosen archetype. In these cases, it is possible that your public facing employee’s natural tone of voice and communication style already align with the chosen archetype. These cases are rare and in all other cases, training is necessary to ensure that the tone of voice is consistent from one speaker to another, and across time. Once your public facing employees have been trained on the archetype and it’s implications for behavior, tone of voice and “personality”, consistency in the external communications becomes much more prevalent. Archetypes help with external communications. As the previous two sections show, there is great similarity between internal and external communications. Yet this is not the way most organizations think (or behave). This becomes painfully clear when you examine the structure of these organizations: internal communications are the responsibility of HR; external communications are the responsibility of marketing and sales—completely separate departments. Archetypes have the power to link these departments. And given the rising importance of the topic of “alignment,” archetypes are a timely way to introduce this issue to your organization. Archetypes create messages that resonate with their audiences, through clarity, consistency, and trust. To create messages that resonate with audiences you must provide clarity and consistency. As a result, you can build trust with your audiences. All these help your messages resonate with your audiences. Let’s look at these one at a time. Audience engagement can be viewed as a series of steps that build your audiences’ trust. The commercial sector in which you compete is a noisy place; there are lots of competitors trying to get attention. Cutting through this noise and engaging with prospects requires discipline and focus. Cutting through this noise requires clear messages; without clarity you’ll just be heard as one more bit of the general noise in the market. Clarity is crucial; we want to paint a clear picture, allowing prospects who are interested to take a step closer, and prospects who are not to retreat. Archetypes provide this clarity. By providing a well-defined guideline for your tone of voice and your personality, an archetype will help your team create clear messages. 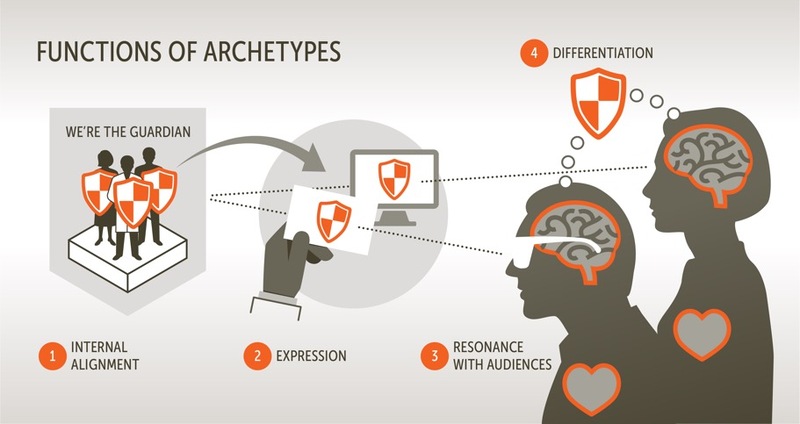 Archetypes get their power through the pattern matching that occurs within our audiences. Our audiences recognize parts of the pattern (in communication, in products and services, or in culture) and they tend to complete the pattern and interpret meaning from it. They do this unconsciously; this tendency to complete the pattern is a very powerful instinct, and a very powerful tool that we can use to create resonance with our audiences. The greater the match between the pattern we show the audience and the pattern that the audience already knows (that is, the pattern that they already carry in their head), the more the audience will assume, unconsciously, that they know and understand the pattern. The more they know and understand the pattern, the more they’ll draw meaning from the perceived pattern, whether the meaning is actually present or not. This brings up two points. First, this pattern matching instinct is a primary reason why it’s important to use an existing pattern, one that our audiences already know. For example, everyone has an idea of what a concierge does, the pattern of behavior that a concierge would exhibit, and the type of language that a concierge would use. That is why a concierge could be a powerful archetype; it is a shared understanding—a shared pattern. But very few audience members would understand what a “shuttle process optimization technician” might do, what pattern of behavior this person might exhibit, or the type of language that might be used. That is why a “shuttle process optimization technician (whatever that is) would be a poor archetype; it does not represent a shared understanding or pattern. This is why it’s important to pick an archetype that represents shared understanding and shared meaning. Second, the more the pattern that we show our audiences matches the pattern in their mind, the more they’ll assume that they already know the pattern. And the more detail they’ll fill in on their own, using their pattern as a guide. As I’ve written about elsewhere, in these cases our audiences are actually doing our marketing work for us, filling in parts of the pattern that may be missing. Figure 2. How many legs does this elephant have? 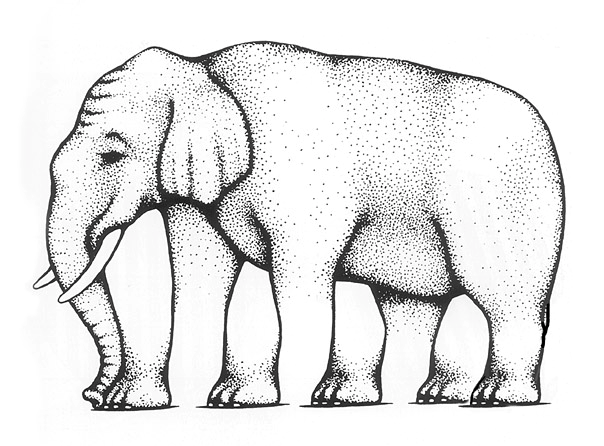 When you first glance at this illustration, you’ll see four legs, because you expect to see four legs on an elephant. After all, an elephant is a part of a pattern of animals that have four legs. However, if you cover up the top half of the drawing and closely examine the bottom half, you’ll actually be able to count 5 legs. This illustrates the point: audiences take pieces of the pattern they’re shown and match it against patterns they already know. Once they find a match, they’ll compete the pattern using their internal expectations as a guide, completing the pattern as they expect it to be completed. You didn’t see the elephant as it actually is on paper; you see enough of the elephant to recognize the pattern, and your brain completed the pattern on its own, even though the pattern in your head did not match the pattern on the paper. This pattern matching yields consistency in two ways. First, if your organization has done a good job training your employees about the archetypes you’ve chosen, and the behavior, thoughts and language that this archetype would use, then the people who are creating communications for your organization will tend to create communications that fall in line with the pattern. That is, they’ll create communications that are more consistent with the pattern that they’ve been trained to associate with your organization. Second, your audiences will interpret your communications in a more consistent manner. Just as in the elephant example shown in figure 2 above, your audience members will see and hear what they expect to see and hear, based on a consistent, pattern they already carry in their heads, a pattern that is commonly shared by everyone. Organizations that select an archetype and train their employees in communicating using the tone of voice authentic to the chosen archetype see a marked increase in consistency. As I’ve written about elsewhere, buyers now have more power than ever before. In fact, Dan Pink, in his book To Sell is Human, maintains that the commercial marketplace should now be characterized more by caveat venditor (let the seller beware) than by caveat emptor (let the buyer beware). This shift comes from the rising power that shoppers and buyers now have. Combine this rising power among buyers with the increasing anonymity afforded by the internet, and marketing now has to carry a greater load than ever before. Marketing now has to educate the unaware as well as inspire the interested, and thereby help prospects move from one phase of the buying cycle to the next. To help prospects make this transition from one phase to the next, marketing has to create an atmosphere of trust. This trust is all important; without it, potential buyers will retreat. How is this trust built? It is built, in part, through clarity and consistency. Messages that are clear and consistent paint a single picture for an organization. Figure 3. In each row, you see a series of shapes. How confident are you that you could correctly guess the next shape in each series? Most people are extremely confident that they could guess the next shape in the top row, and extremely doubtful that they could guess the next shape in the bottom row. That is, they “trust” the person in the top row, and don’t” trust” the person in the bottom row. The difference between the two rows is simple: the shapes in the top row are both clear and consistent; the shapes in the bottom row are neither clear nor consistent. Trust comes, in part, from clarity and consistency. Trust is also built through authenticity. If you choose your archetype correctly, your archetype will resonate with your culture. This resonance will help your tone of voice sound authentic, because it will be authentic. That is, the proper use of archetypes lays the groundwork for authentic communications, which are both clear and consistent. The consumer packaged goods industry is full of products where the primary (some would say the only) difference is the archetype used. Coke vs. Pepsi is the classic example. There’s not much difference between these two products, and many people can’t reliably identify which product is which in a blind taste test. In sectors where products and services aren’t discernably different by themselves, marketing must step in to create and communicate a difference that is meaningful to the audience. Archetypes are a powerful way to accomplish this. Similar to the consumer packaged goods market, the life sciences are full of situations where differentiation is difficult. Two that spring readily to mind are 1) life science sectors where there is significant regulatory oversight of work product, work process, or claims, and 2) life science service companies that have grown so large that they offer essentially the same services that all their large competitors do. Regulated sectors in the life sciences often suffer from lack of differentiation, because regulatory scrutiny tends to impose consistency and sameness among offerings. Regulations often cover both work product and work process, imposing uniformity. This uniformity makes it easy to review both work product and work process, which leads to clearer interpretation of the scientific questions under consideration. If you can’t point to your work process or your work product to differentiate your offerings, then how can you create meaningful differentiation in the minds of your audiences? The uniformity which regulators love creates havoc in the minds of the audiences and in the marketing departments of life science organizations worldwide, because it’s hard to create meaningful differentiation. Life science organizations need to take a page from the playbook of the marketing masters, those consumer packaged goods markets where there is little differentiation between the products or services themselves. Archetypes can help life science companies differentiate their regulated offerings. Many large service companies in the life sciences (think CROs, labs, CMOs, etc.) look surprisingly similar to their competitors. In many cases the list of services offered is extremely broad. Given this breadth, the major competitors often match up bullet point to identical bullet point. Archetypes help life science companies differentiate offerings that look identical. Archetypes have four main roles: internal alignment, external and internal communications, resonance with the audience, and differentiation. What other tool in the marketing toolbox can make the same claim? None that I’m aware of; archetypes are a powerful lever to move your marketing and sales to the next level. In the next issue, I’ll cover several specific situations for life science marketing and sales in which you’ll find archetypes especially useful. As you read through this list, I’m betting that you’ll find one or more situations that are applicable to you and your specific sales and marketing challenges. Gaining differentiation (and pricing power) through the use of archetypes in eClincal marketing.